To celebrate National Popcorn Day, I decided to make some AMAZING zebra popcorn! 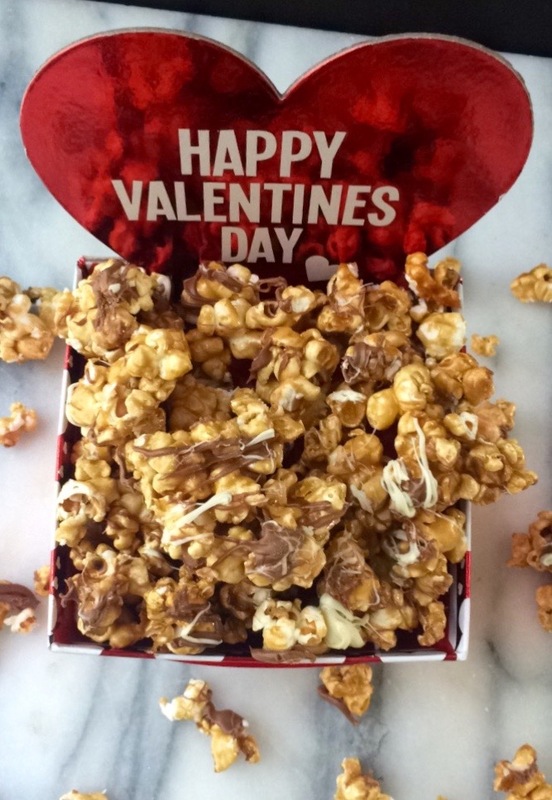 This popcorn is perfect for a casual night in as well as Valentine’s/Galentine’s Day movie night with the girls! Great for goodie bags at the end of a party, or just for yourself. To be shared and to be selfish, this is the perfect popcorn for anything! Check out the recipe below!! In a saucepan, add brown sugar, corn syrup, salt, and butter. Bring to boil for 5 minutes while continuously stirring and scraping sides of the saucepan. Remove from heat and add your vanilla and baking soda. Stir until mixture has thickened. Pour over popcorn mixture mixing popcorn and caramel as you go along to give a nice even layered coating. Transfer caramel popcorn to wax paper lined baking sheet to a single layer. Cool completely. Once cooled, bake in the oven for 1 hour stirring the popcorn every 15 minutes. microwave chocolate for 30 seconds, stirring in 15 second intervals until smooth and melted. Drizzle over popcorn and let cool completely before separating the popcorn into pieces. The popcorn takes about 2-2 1/2 hours to make all together, but it’s definitely worth it and will make all of your friends jealous! The popcorn lasts up to a week in a zip bag, but I don’t think it will last that long! This looks delicious! I will need to try to make this!! This is my favorite popcorn to buy when I go to any sporting event at the Staples Center. Now I don’t have to spend all that money and I can make it at home. Yay!